10 Tips to Start Running! 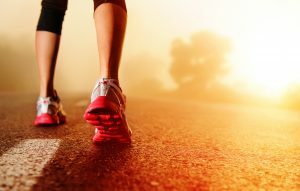 New to running or just out of the game? Spring is running season and the races and events may be a tempting challenge, but where should you start? RAC Personal Trainer and resident running expert Ashley Foos has 10 tips for runners looking to get back into the swing of things. If you know your shoes are 2+ years old or you have run over 500 miles in them already, most likely you are in need of a new pair. Proper shoes help prevent running injures and relieve stress on your joints. Get fitted at your local running store. As a RAC member, you receive special discounts at both Altitude Running and Runner’s Roost — just show your RAC card when you go in! Don’t attempted your first long distance run if you’re not ready for it. Pushing yourself too hard can result in injury. Ease into it. Try to progress your mileage by just 10% each week. If you’re a newbie, or an advanced runner, strength training will help you run more efficiently and help correct any muscular imbalances. Mix it up with both cardio and strength exercises as you train. This is key for all runners… Running does not hurt your body, it’s the way you run that does the damage and causes pain. The primary causes of injuries are poor running form and poor biomechanics. Build a good foundation by analyzing your running gait, correcting your form with a coach, and being analyzed. Don’t ignore a proper warm-up routine before a run. Run-specific warm up exercises allows your body to be fundamentally prepared for the biomechanics required in proper running form. To prevent injury, you must maintain good flexibility and good range of motion in your joints. Running is a very repetitive motion that creates a lot of stress on the body. Release muscle tension and knots by stretching and foam rolling as often as you can. A foam roller is a runner’s best friend. If you have a race coming up, make sure you don’t start your training program too late. It’s never a bad thing to be over-prepared for your next upcoming race. A majority of running injuries happen during a race due to inadequate training. Make sure you are consuming a clean/healthy diet: plenty of healthy and complex carbohydrates, solid proteins, and healthy fats. Junk and acidic foods upset the stomach and won’t make for a pretty run. Feed your body nutritious food. You’ll have more energy overall and feel better during your runs. Don’t spend too much of your training indoors on treadmills. Running on a treadmill is not natural, and is actually “easier,” giving the false impression of speed and distance ability. You will be better prepared for races and become a stronger runner when you train outdoors. Running shouldn’t be hard. It’s a natural movement. Don’t overthink it and don’t force it. Relax your mind and relax your body to move naturally.